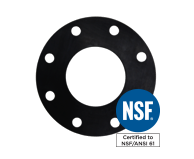 NSF/ANSI 61 certified for potable water and very good dielectric strength. 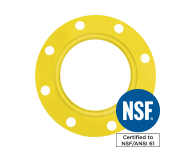 NSF/ANSI 61 certified and meets/exceeds NSI/AWWA C111/A21.11 compound requirements. Custom cut gaskets manufactured by A.R. Thomson Group, an NSF Certified gasket fabricator. Typical Service: Drinking water applications. 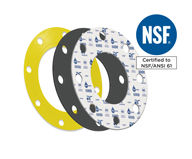 AWWA compliant and NSF/ANSI 61 certified pipe flange gasket with dual sealing rings that concentrate the gasket load and reduce torque required to seal by up to 75%. Toruseal also has exceptional dielectric strength. 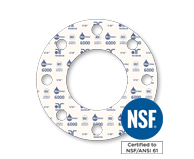 Typical Service: Potable water and other applications requiring an NSF/ANSI 61 or AWWA compliant gaskets. Toruseal® is a registered trademark of the American Cast Iron Pipe Company.